Amy Poehler’s new vehicle got some pretty crappy early reviews. I just watched it this afternoon, and I was pretty impressed. Critics say it’s a little too close to The Office (mockumentary style, talking head interviews, naive protagonists you want to root for, etc.) While this critique may be valid, I’m not complaining. If three Law & Order‘s, and three CSI‘s can coexist (under the same title no less) than I am a-okay with a show with a similar format to The Office. Duplicating a funny, and successful comedy? Why the hell not. A show called Larry Unmarried would be a different story. Also, it’s fantastic to see Paul Schneider again. I loved him in The Family Stone and All The Real Girls. I didn’t hear about his involvement with the show at all, but he’s definitely a super addition to this cast. If Kath & Kim can not only last but get a second season pick-up, then Parks & Recreation should find a nice home on NBC Thursday nights. I’m already rooting for it. This just in: Amy Poehler was in the cold open this week for SNL. It was marvelous. I didn’t realize how much I missed her until I saw her do Hillary again. I was just getting used to her not being around and then bam, she’s back in my living room. This will sting all over again when she’s gone. PS: John Malkovich is killing this monologue. This is going to be a fun episode. It’s been a slow news week. We’ll keep it short. Wanda Sykes came out of the closet at a Prop 8 Rally over the weekend. You go girl! Check out this timely clip from an old stand-up special. And I finally have one reason and one reason only to give a crap about Jimmy Fallon taking over on Late Night…The Roots are going to be his house band. Guess who’s joining Amy Poehler on the Office non-spinoff? Rashida Jones. You may remember her as Karen…from The Office. That’s not confusing at all. Michelle Collins over at Best Week Ever crunched the numbers behind the lanky, awkward girl gyrating with Beyonce on SNL last week…hilarity ensued. Bob Hope is getting put on a postage stamp. It’s about damn time. And finally, my favorite non-TV related link of the week: Kids reading books to dogs! The video with the article is a must watch. It’s adorable/hilarious. And now the first ( and probably last) installment of So Happy, So Sad. It’s exactly what it sounds like. 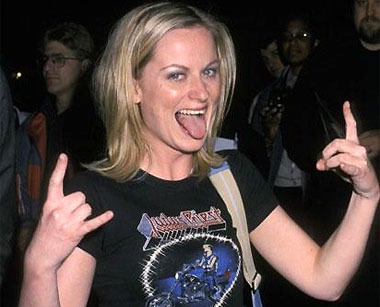 So Happy: Amy Poehler gave birth to a baby who could quite possibly have the best comedy genes ever. Archie Arnett was born yesterday, weighing in at 8 lbs 1 ounce. Mom, baby and husband/new dad Will Arnett are doing just fine. So Sad: While we welcome Archie and can’t wait to see all the hilarity he has in store for us, his arrival signals the end of Amy Poehler’s run on Saturday Night Live. However, odds are she’ll come back for a cameo or two, or maybe even as a host soon enough. Yes, I thought the latest Fey as Palin sketch was hilarious, thanks for asking. Like every blog ever in the past two days, I will go ahead and link to it in case you missed it. However, I finally caught the full episode of Saturday’s SNL and I must say, this sketch was much funnier. Now more than ever, I am confident Kristen Wiig will fill Amy Poehler’s shoes well when she departs the show following the election. This is my Super Bowl. I’ve booked and scheduled every minute of my day today to ensure I can successfully be in front of my television and ready to watch in awe without feeling guilty about homework, job applications, etc. I’ve studied, I’ve read thousands of blogs entries and watched even more hours of TV in preparation for this night. This is my thing. This is the one night my medium gets to truly celebrate itself. After a long year with a Writer’s Strike and turmoil with the actors, the industry needs this. Frankly, I need this too. So here are my picks for the primary categories at the 60th Primetime Emmy Awards. I pretty much stuck to party lines here (30 Rock & Mad Men) but in categories where I couldn’t, I went with my instinct…even if it means Ryan Seacrest wins an Emmy. Think I’m totally off base? TV Addict is holding an Emmy picks contest and the winner receives Season 2 of 30 Rock. Press your luck and enter here. Happy viewing folks!